Here’s some important information which could save lives. Four simple indicators of a stoke. Neurologists say if they can get to a stroke victim within 3 hours they can totally reverse the effects of a stroke…totally. The trick is getting a stroke recognized, diagnosed, and then getting the patient medically cared for within 3 hours, which is tough. STROKE: Remember the 1st Four Letters….S.T.R.O. If he or she has trouble with ANY ONE of the first three tasks, call emergency number immediately and describe the symptoms to the dispatcher. O* Ask him to stick O*UT HIS TONGUE. If the tongue is ‘crooked’, if it goes to one side or the other,that is also an indication of a stroke. Some of the symptoms that a person may expect to experience during the occurrence of a mini stroke include such issues as blurry vision, feelings of dizziness, confusion, numbness in certain areas of the body, difficulty speaking and being unable to move a specific area of the body usually limited to one side of the body. There’s a pathological entity known as transient ischaemic attack (TIA) in which the initial stroke-like symptoms resolve. 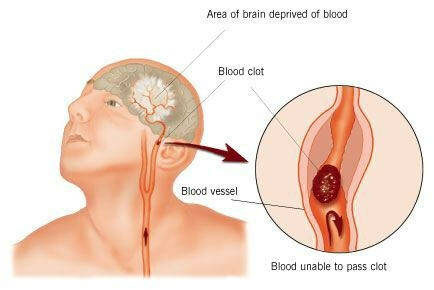 Such a person is at risk of later having the full ischaemic stroke the diagram depicts. It sounds likely that the person in the email had one of these. I believe that the treatment you mention for stroke within three hours of symptom onset is thrombolysis. It can reduce (not reverse) the effects of stroke but is a high risk treatment that can also turn the ischaemic stroke into a cerebral haemorrhage. Neurologists juggle the potential benefit of treatment against the potential risks.